One of the organizations which hosted the Brussels meeting was ABEVA, the Belgian Asbestos Victims' Group. Its President, Eric Jonckheere, is in Canada this week for a series of meetings with asbestos victims, grass-roots campaigners and representatives of civil society. Speaking from Canada yesterday, Eric told Belgian journalists My lungs are full of Quebec asbestos.3 Accompanied by French ban asbestos activist Alain Bobbio, Eric plans to visit the mine which supplied the asbestos to the Belgian factory where his father Pierre worked. Eric's father, mother and two brothers died from the asbestos cancer mesothelioma. Eric and his brother both have pleural plaques, a condition which signifies exposure to asbestos. 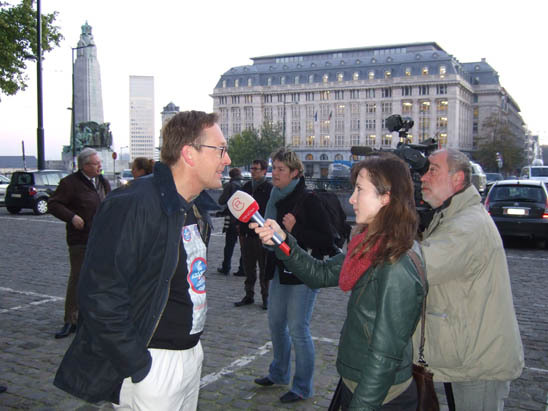 Eric Jonckheere being interviewed by Belgian TV outside Belgian Court in 2011. 1 Kazan-Allen L. Canada, No More Asbestos! September 16, 2012. 2 Kazan-Allen L. Asbestos at the Heart of European Debate. September 20, 2012. 3 Leherte A.O. Des Belges au Canada pour sensibiliser les victims de l'amiante. September 27, 2012. 4 Morden P. Asbestos battle not over, activists say. September 26, 2012.